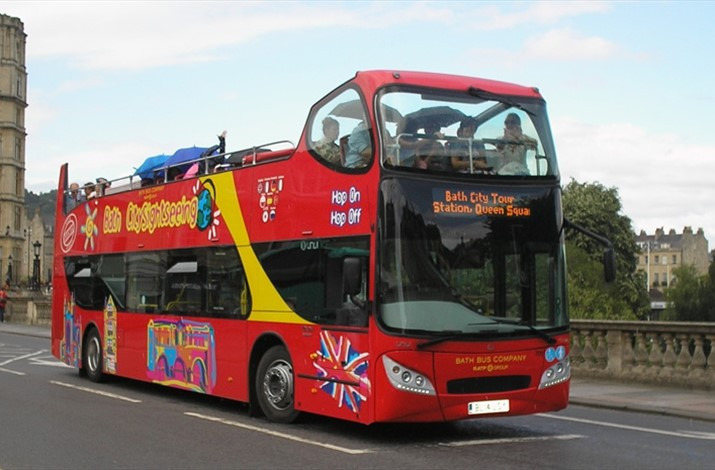 Bath City Sightseeing offers 'hop on hop off' guided bus tours of the city centre and the Bath Skyline. Your ticket will cover both tours and is valid for 24 hours (covering two days if required). Commentary is provided in up to 10 different languages. The city tour has 17 stops covering the majority of the tourist attractions in Bath, including the Royal Crescent, Pulteney Bridge and the Circus. The Skyline Tour takes you past the American Museum, around Claverton Down with its panoramic views of the city, and to Prior Park Landscape Gardens. There are frequent departures from points all around the city, with tours operating every day of the year except Christmas Day, Boxing Day and New Year’s Day. Under 5's travel free. If you opt for FREE COLLECTION from the Bath Visitor Information Centre, tickets MUST be collected from our office BEFORE you use your package, otherwise you will not be admitted. Our office is open until 17:30 Monday to Saturday, 10-4 on Sundays, and can be found at Bridgwater House, 2 Terrace Walk, Bath BA1 1LN.